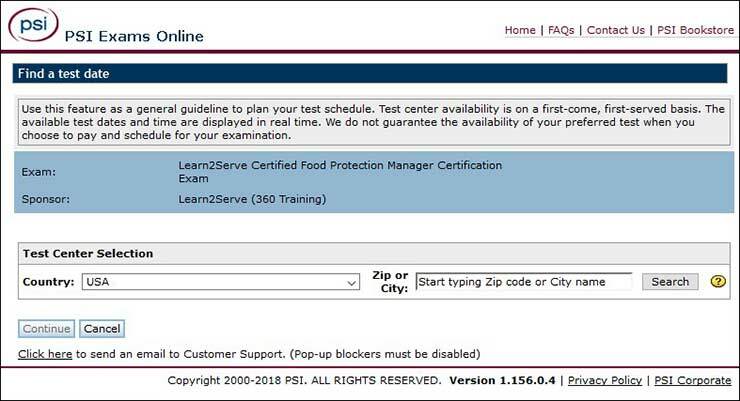 The Learn2Serve Food Safety Manager ANSI Certification Exam is approved by the American National Standards Institute (ANSI) and the Conference for Food Protection (ANSI-CFP). The intent of this examination is to certify that the food manager has demonstrated - by means of a food safety certification examination to an organization - that he or she has the knowledge, skills, and abilities required to protect the public from foodborne illness. This accredited exam is accepted nationally in states and jurisdictions that have mandatory certification requirements for Food Management Professionals. The final exam must be passed with a 70% or higher to get credit for certification. The Exam must be proctored at a local 3rd party (PSI) test center location. Click here to check for an exam location near you. Note: Except Texas - which is online. Approved by the Texas Department of State Health Services (DSHS), the Exam is scheduled and taken entirely online. The Food Safety Manager Principles Course provides necessary training leading up to the Food Protection Manager Certification Exam. This course covers food safety issues, regulations, and techniques to maintain a food-safe environment.